The modern newly remodeled “Galleon Bay” Bayfront Condo offers 2 Bedrooms, (Sleeps up to 4) 2 Full Baths, Resort Pool, Hot Tub, Breathtaking Bayfront Balcony, Full Size-Fully Equipped Kitchen, LCD TV’s, Wi-Fi , and so Much More than the Mind Can Conceive! The “Galleon Bay Living Room” is sure to be a favorite with its vast bay view. The “Galleon Bay Living Room” area décor features modern furniture set atop new tiled floor. Accessing the balcony is just a step away. 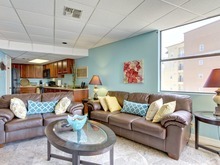 Living room includes a flat screen LCD TV for your family’s evening fun and entertainment bonding time. The “Galleon Bay Bedroom 1” features beautiful King size beds, with plush quilts and brand new mattresses, sizable bathroom and closet and an LCD TV. The “Galleon Bay Bedroom 2” features a Queen sized bed, newly remodeled bath with granite vanity, a standing shower. Professionally decorated in tropical theme. Enjoy the flat screen TV for night time viewing of your favorite shows. There is BBQ area by the bay. Private boat dock is available. Please ask for details if you would like a boat slip to be reserved. Pool and hot tub have bay views.